The idea of creating a base, or even a fully fledged nation, in the middle of the ocean where none previously existed is not new. Through the undersea bases and floating man-made islands of science fiction humans have long pondered how to colonize the vastness of the ocean for both warfare and peace. As far back as the 19th century, Jules Verne’s Captain Nemo took to sea in the Nautilus to escape the governments ashore. Such thinking has on one hand guided the Navy’s development of aircraft carriers and the U.S. Marine’s Mobile Landing Platforms – and on the other hand given us cruise ships and man-made islands in Dubai. But no one has yet created a new nation from scratch. The so-called Principality of Sealand, founded on an abandoned sea fort 6 miles off the coast of England (then beyond the standard 3 miles of territorial water) in 1966 comes close, but has not been internationally recognized, is not self-sustaining, and was created without much forethought or room for growth (although you can purchase yourself a title of nobilty from the website). While not short of enthusiasim or imaginination, the non-profit Seasteading Institute, founded in 2008, has set about to make the dream of colonization of the seas, or seasteading, a reality through practical steps and grounded analysis. By taking a long-term approach and funding detailed studies of international law and engineering the institute hopes forethought will help the endeavors that do materialize avoid the pitfalls of a type that bedevil Dubai’s islands, which carry on a running battle against the sea’s attempts to angrily reclaim its territory. As a first step in their journey the Seasteading Institute announced this weekend that they had received a donated 275-foot boat, appraised at $10 million and capable of carrying 900 passengers, which they hope to use as a platform for testing seasteading business concepts (more on the boat in a later post). What is the mission of the Seasteading Institute? We’re interested in providing people with new opportunities. We think seasteading can give people the chance to create new business opportunities, new societies, and new governments in international waters. This is a long-term dream that we realize is not going to happen overnight. We are going to start small and have to provide financial opportunities that will pull people out there; they’re not going to be pushed. According to your website, one of the aims of seasteading is to “Improve Governments” – how would it do so? We have no stance on what governments ought to look like – but we recognize that established governments have a difficult time changing. They’re rooted in a particular way of doing things and bureaucracy. We want to provide the opportunity for all kinds of innovative ideas that can’t be tested as easily in established governments. Do you envision seasteads as clean breaks from existing governments, extensions akin to new territory, or a mix of both? There’s potential for a mix of both, especially in the early years of seasteading. To avoid legally being a pirate, seasteads will have to flag themselves with the flag of an existing nation and partner up. As seasteading matures and grows, we foresee seasteads eventually breaking off when they have enough of their own economic power and population to no longer need to be binded to existing governments, when they’re at a point where they can be recognized by others as a micro-nation. Have you talked with any states about flagging options? There’s a study on our website that gives an outline of aspects of different flags. The choice for an individual seastead would be based on what business you’re running, but generally you want it to be one that has good diplomatic and legal systems. If you do get into a conflict, you want it to be one you can trust has a good legal backbone and that you can trust will respect you. Do you have any thoughts on where seasteads may be initially located? On our website we have also put up a location study online. Weather is a major variable, as are sea conditions, proximity to economic opportunity, and a location near a major metropolis. It’s not until sometime in the future that you’ll see seasteads further out into the ocean. 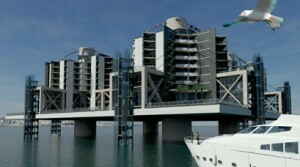 Seasteading Institute – Flagging from The Seasteading Institute on Vimeo. What sort of opportunities besides flagging are there for partnering with existing governments? For example if a government were to offer a special economic zone close to or within their territorial waters. There’s no official cooperation at this time between seasteaders and any governments, but in the past we have spoken with higher-ups in governments and been treated with respect, not faced by people resistant to the idea. Is there a worry that if seasteads do ultimately prove successful some governments may try to annex the territories, or force an evacuation if their citizens are threatened? Of course there’s that concern, which is why we really want all seasteads to be diplomatic. We don’t want them to scare the horses. They have to choose practices that aren’t going to be perceived as threatening to their neighbors. Has there been any thought given on the need to defend seasteads against a potential hostile government? There’s a report that an intern did on security on the seasteads. We advocate the use of non-lethal force and would like to promote peace. Not putting a seastead in heavily pirated waters would be a good place to start. Maybe 40-50 years from now they could have a very sizable Navy, but the reality is no seastead is going to have one that would contend with the U.S. For the foreseable future is makes more sense to act cooperatively and diplomatically with existing governements. Our goal early on is to communicate to legislators and bureaucrats in the government what we are, who we are, and what we’re promoting so they’re prepared for us. We plan to keep our eyes on laws to try to influence them so they’re friendly to us. Additionally, in these pioneering years it’s important to not do something that provokes a hysterical reaction, and instead to get people excited about the opportunities we hope seasteading will provide. We believe seasteading can benefit anyone eventually. The best ideas will be transferred to existing nations, and we may see some problems in the U.S. government recede when ideas first tested in a micro-nation are implemented. What models or historical examples do you draw lessons and parallels from? Hong Kong, Singapore, Dubai – these are very successful major metropolises that have broken off from a major nation and been able to provide new opportunities. What sort restrictions does international law place on seasteads within territorial waters and a country’s Exclusive Economic zone [EEZ]? Some of that is still pretty grey. I don’t want to overstate something and am not a legal expert. Right now a vessel is a vessel in the eyes of some courts. We recommend a seastead locate at least outside of territorial waters [12nm], or 24nm to reside out of a nation’s contingency zone depending on what they’re engaged in. Personally, what excites me the most is aquaculture. I think seasteading has the opportunity to feed the world’s population, take carbon out of atmosphere, reduce ocean acidification, and provide economic opportunity to farmers and ranchers in the U.S. by raising bivalve, fish, etc. Currently this can’t be done within 200nm of a country’s coast – it would have to be done further out or with permission of the government. The U.S. is almost the most conservative nation when it comes to what it will or won’t allow in its EEZ. It’s easier in Asia to do ocean farming. We’d like to do some trial projects, but I don’t know of any permits for ocean aquaculture at this point. One the Seasteading Institute’s areas of strategic is “Conducting engineering research for long-term engineering challenges.” What are you looking into? What can we do to make a city that will stand up to the difficulties of the sea? How do we make people comfortable living there and confident the city won’t sink or rust away? What’s the best way to design and deploy floating breakwaters? How can they get their energy in a responsible way? Wave power, solar polar, thermal conversion. Making materials longer-lasting than steel or maybe even concrete. We’re trying to network with those in both industry and politics, so that they might be both interested and prepared. There are lots of opportunity for industry. If we can excite them about seasteading, they’ll get behind us and also exercise their influence to encourage governments to embrace the concept and what seasteading can do for both governments and their people. What are some of the biggest accomplishments of the past 5 years, and what should we look for in the next 5 years? We’re proud of how seasteading’s base has grown. We’ve helped make seasteading a word recognized in pop culture, we’ve helped conduct research in legal and engineering fields. And, as you’ll notice in our newsletter on Sunday – we’ve just been given a ship that we’ll be able to use as a seasteading platform to advance tech for long-term ocean inhabitation. As for the next five years, we’re looking for partners. We see ourselves as a think tank, helping others figure out ways to grow. We believe the for-profit sector ought to take the lead in investing in the business opportunities – we don’t have enough money to do so ourselves. We think we’ll eventually see viable seastead platforms in the next 5-10 years. Randy’s last name is Hencken. You may want to correct some of the references to his name in the blog and index pages. Thanks for the catch Jeff.